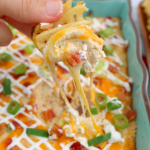 This hot, cheesy dip is perfect for game day! 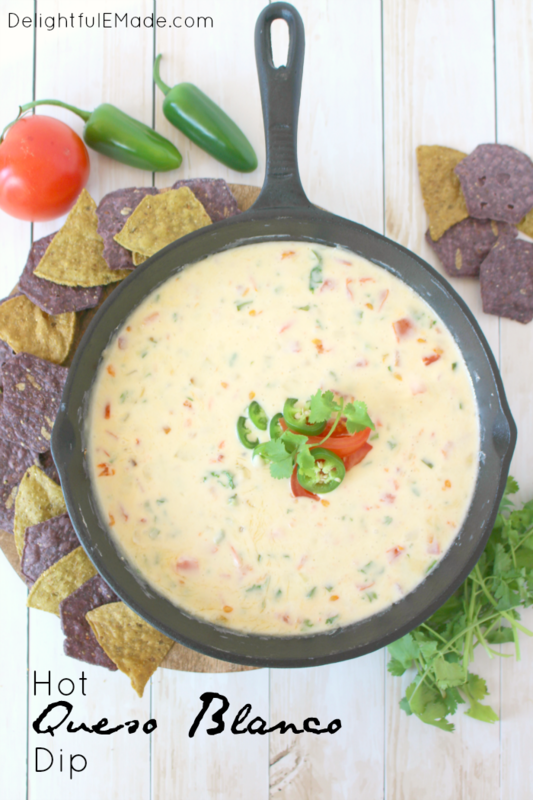 Loaded with two types of cheese, along with fresh tomatoes, jalapenos, and onions, this restaurant-style queso is the perfect appetizer anytime you want a great snack! Raise your hand if you love cheese? Yep, I’m right there with ya! I especially love a really great queso dip to go along with chips. 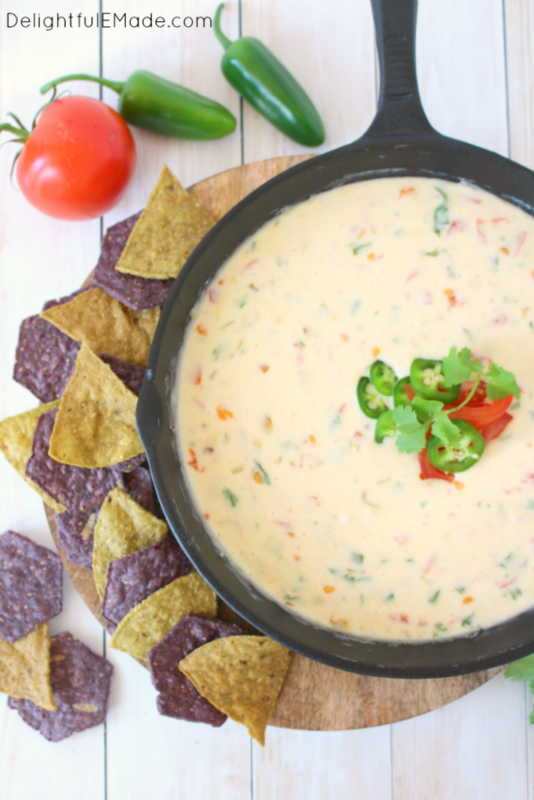 Warm, creamy with just the right amount of tomatoes and peppers, this queso blanco is the perfect cheesy appetizer for watching the big game! 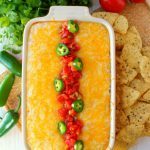 From the beginning of football season in September, all the way into basketball season and March Madness, this dip is one of our go-to appetizers, perfect for feeding a crowd. This queso blanco is super simple to make. You’ll start with sauteing yellow onion, along with a couple diced jalepenos. I take out the seeds so it’s not super hot, but it still brings just the right amount of heat. To the onions and peppers, you’ll then add shredded American and Monterey Jack cheeses to the hot skillet, along with a some half and half to keep it nice and creamy. As soon as the cheese is melted, you’ll then add fresh tomatoes and cilantro. I love the addition of these two ingredients – they add such a nice blend of flavor and freshness to the rich, creamy dip. 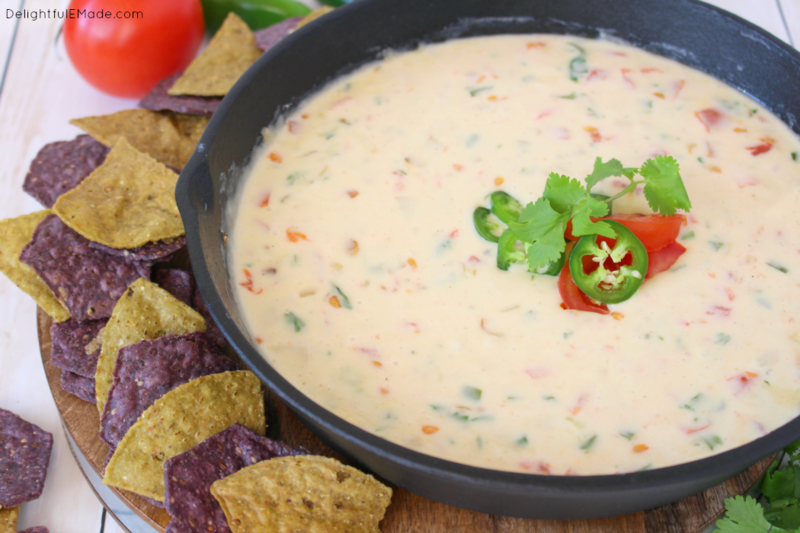 Anytime you have a great queso dip, you’ve got to have equally awesome chips to go with it! 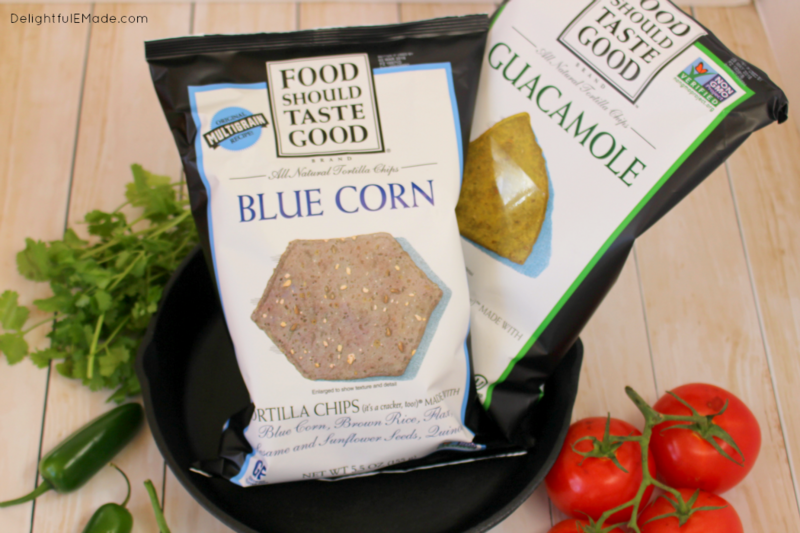 Some of my favorites are these amazing Guacamole and Blue Corn Tortilla Chips by Food Should Taste Good. 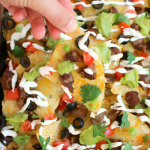 These chips are perfect to go with a great dip, as they’re thick and sturdy enough to hold the most generous amount of queso. The flavor and texture of these chips are also amazing! Made with the highest quality ingredients, these chips are also all natural, certified gluten free, certified vegan and kosher, and have no artificial preservatives, colors or flavors! 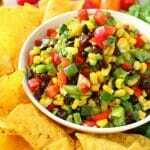 These chips are also amazing with my Southwestern Corn Salsa and Loaded Guacamole. 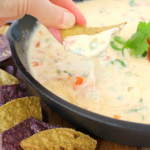 This easy Queso Blanco and chips are perfect for watching the big game. It’s great to feed a crowd, and is also fantastic served with tacos, enchiladas, and burritos, too! In a medium skillet, add the oil and heat over medium high heat. Add the onion and peppers, and saute for about 5-10 minutes or until onions look translucent. Reduce the heat to low. Add the cheeses to the skillet, and gradually add the half and half stirring often. Add more half and half until the cheeses and smooth and completely melted. Add the diced tomatoes and cilantro, and stir together until incorporated. 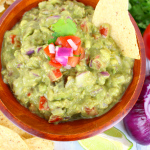 Serve the hot dip right away with the Guacamole and Blue Corn Tortilla Chips. Enjoy! Yum!! 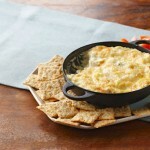 I love cheesy dips! Thanks for sharing at #HomeMattersParty! 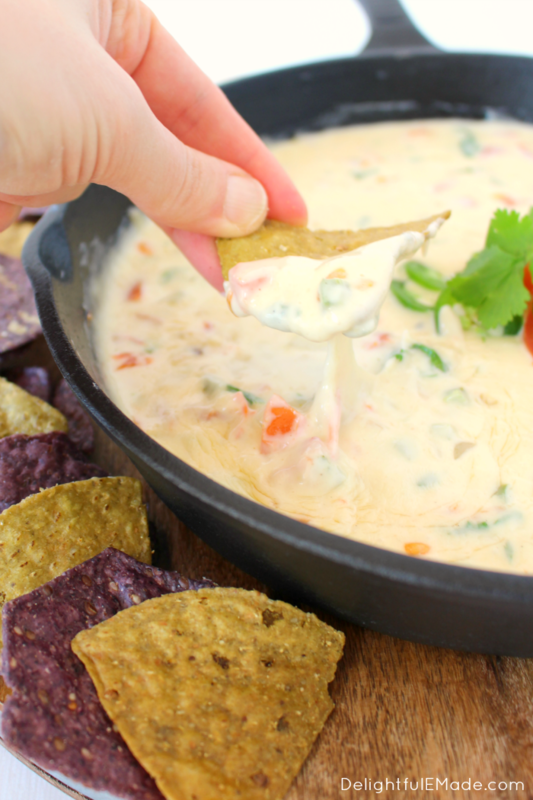 That queso dip looks so so good! It's perfect for Game Day too (I might claim it for myself!) Definitely need to try those Corn chips... I love the sound of them. Thank you so much for sharing this with us at #SaucySaturdays! I hope you join us again this week! :) Pinned and Sharing! Can't wait to try this recipe! Looks delicious! Looks amazing!! Thanks for sharing on the What's for Dinner link up! I love queso! Thanks for sharing your recipe at Motivation Monday on Mom Home Guide! Me! I love cheese and this has my mouth watering! Thank you so much for sharing it with us at Funtastic Friday! It's super bowl time! Thanks for sharing at the What's for Dinner link up!